In addition to miscellaneous installed surface water storage tanks, the big Ribe water project news centered on completion of the community deep well. I’ve attached photos Tito Katama took earlier this week of the secured pump house and storage tank. When the pipeline is run up to the girls’ secondary boarding school (between now and August), I’ll consider the 2016-17 project completed – with a frosting cover on an amazing cake. 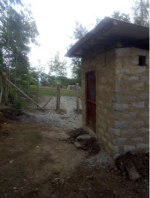 When all is said and done, the total water project cost this year (with the pipeline exten- sion to the girls’ school) will nudge up over $26,000, making it the most ambitious fund- raising effort since the 2011-12, when we raised $22,000 to fund the village’s surface water distribution network (the one with 52 spigot sites). Next year, we’ll likely embrace a maintenance initiative: adding new water storage tanks, repairing any network lines, initiating a drip irrigation project (garlic and other spices), etc. I’m excited to see what God has in store for next year... our ninth, Whew! 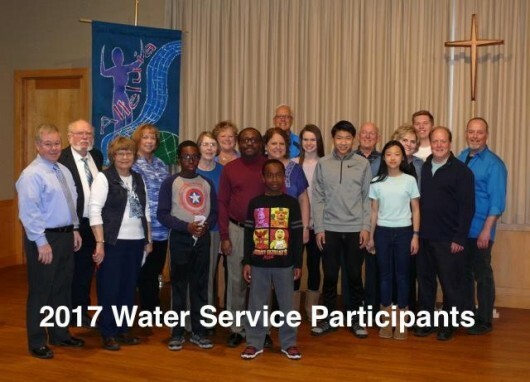 During January and February, many of our members led our Water Service "Sharing God’s Word through Music, Drama, and Beauty” at three area churches, Southminster and First Presbyterian in Waukesha and Living Hope in Menomonee Falls. It was a delightful and significant experience for each of us. A quote from Ghandhi helps to describe our experience: "The best way to find yourself is to lose yourself in service of others". Or Winston Churchill, "We make a living by what we get, but we make a life by what we give." It was fantastic to worship with a new congregation each week, sing with new choir members and have wonderful conversation with fellow Presbyterians who really appreciated the entire worship experience. Everyone had their favorite parts and it was wonderful to hear from them. But even more worthwhile was the opportunity to volunteer our talents and time to lead and share valuable information about a necessary and significant cause, the Water Project in Ribe Kenya. As the members of these churches learned about the purpose and goals of this project, they gave generously and we were able to raise $4,000 in donations. David Block and donors through his church and the Carroll University will match this for a total of $8,000! David included a timeline/summary of the partnership activity between Carroll and Ribe. Between 2011-2017, the Ribe projects have been tied to an annual academic speaker theme at Carroll and fundraising efforts have tallied just over $80,000. Other than collective faculty/student/ staff/alumni contributions, a few local Presbyterian churches (Heritage PCUSA and my home church, Highview EPC, for example) and a few generous individual donors have been the "quiet" heroes in these annual fundraising appeals. "All who thirst, come to the water! Come all who are weary; Come all who yearn for forgiveness. Drink deeply of the living waters." Congratulations to all of Heritage Church who "Hit the Road" in January and February of this year to share one of our mission areas, the Ribe Water Project in Kenya. It was a delight to visit three different congregations and share our congregation's gifts of music, dama and beauty. We were blessed to have experienced the joy and meaningfulness of the Montreat services in North Carolina and each of the churches that we visited really appreciated all the meaning, drama, music and most importantly the mission of this service. The $1552 we raised will be matched by Carroll University to provide $3104 for the Ribe Water Project. The water tanks needed range in price from $250 - $350 each. 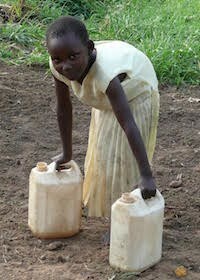 Our gift will mean 6-10 new water tanks for a small village in Kenya. As we learned in our service, that is life-changing for the people of Ribe. Something we take for granted will now be available without walking for hours. And it will be clean and safe. Thanks to all who participated! Thanks to Carrol University for matching our donations. Thanks to Heritage for supporting this dream! Thanks to the churches who invited us into their homes. And thanks to God for giving us this purpose and mission at Heritage. Thanks to your compassion and generosity, a new water tank has been installed in the impoverished village of Ribe, Kenya, as part of an ambitious water distribution project initiated by Carroll University and local Presbyterian churches four years ago. The innovative gravity-fed water delivery system distributes clean water from a large regional water main through a network of buried one-inch pipes to 52 strategically located surface faucet sites. To complete the project, water storage tanks are being installed at each faucet site, so that water can be stored for use during seasonal drought periods. To date, Heritage Church has funded two of the 27 installed water tanks. Praise God for your support of this life affirming endeavor! The attached photos show the newly installed water tank. Fittingly, it is located adjacent to a new two-room home built for an orphaned girl, Zuhura,and her grandmother, Matombo. (Note: the thatched roof on their home had collapsed last fall, and a new structure needed to be built before the rainy season began in spring.) You see, Zuhura is the young girl whose photo graced the cover of Carroll's promotional pamphlet when the water project began three years ago. She was photographed struggling to carry two 20 pound water jugs back to her grandmother's hut for their daily domestic use. Children and women like Zuhura and Matombo once had to walk a considerable distance to get water from a local stream; it had to be strained and boiled before it could be safely used. Now, they have a fresh water faucet site and storage tank close to home. Life is good! For what it's worth, less than 25% of Ribe's rural village homes had access to potable water supplies when Carroll University initiated the expansive water project a few years ago. Today, nearly 90% of the residents are adequately serviced by safe drinking water. 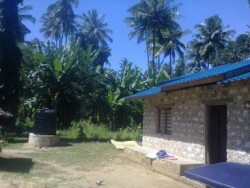 Carroll University and a few local churches have dedicated recent funds to additional projects in Ribe involving installation of electrical service to local primary schools, equipping of a new medical clinic, installation of malaria nets in several at-risk homes, and initiation of a reforestation program for erosion control and fuelwood production. In the coming year, we will be assisting the village with an oral and written history project which will bring youthful and elderly participants together in a meaningful way. We are delighted to share the news that Heritage has collected $704.00 for the Ribe, Kenya Water Project. The offerings were gathered from the two special water services that our youth facilitated at Heritage and at Forest Park Presbyterian. Dr. David Block will be finding a donor who will match the total amount. This gift is enough to purchase two water storage tanks. Plans are to deliver the donation to the village by Christmas Eve. Thank you to the youth from both Heritage and Forest Park churches, youth music director Connie Fellows and all the others who worked hard to make this happen. Merry Christmas Ribe! This fall at Heritage, we will focus on Jesus Christ as the living water for our bodies and souls. In conjunction with this, we are taking on the mission of helping the people of the world who need pure drinking water. We will also focus on the importance of conserving water in our world. To help us reach out to others in the world, we invited David Block, Professor Emeritus of Environmental Science and Geography at Carroll University in Waukesha and former member of Heritage, to join us in worship on September 7th. David spoke about our mission project, Water for Kenya and a special offering was collected to support this water project. Other opportunities to contribute will be offered throughout the year.